Un tempo molto più rara, la Volpoca, una delle anatre più belle, è tornata negli ultimi anni molto numerosa, ed è facile avvistarla in Pialassa della Baiona, dove nidificano con successo numerose coppie. Il nome Volpoca le è stato attribuito perché – per via delle dimensioni considerevoli e della protuberanza sul becco – si pensava che fosse un’oca che faceva il nido nelle tane delle volpi: la volpoca è infatti l’unica anatra che fa il nido in cunicoli e anfratti del terreno e degli argini. I piccoli di volpoca sono abili nuotatori fin dai primi giorni e riescono a immergersi in profondità per fuggire da eventuali pericoli, mentre i genitori tendono a distrarre i predatori utilizzando apposite strategie. 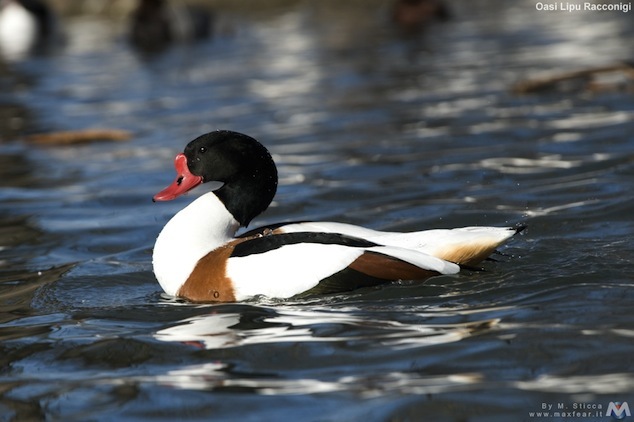 Il nome inglese della volpoca è Shelduck, “Anatra conchiglia”. This entry was posted in avifauna del Delta and tagged Shelduck, Tadorna tadorna, Volpoca. Bookmark the permalink. I intended to post you that bit of remark just to say thanks a lot again for those remarkable pointers you have documented above. It is certainly pretty open-handed with people like you to provide easily just what some people could have marketed for an electronic book to help with making some cash on their own, principally given that you might have done it in case you decided. Those secrets additionally served as the great way to be sure that other people have the identical fervor just as my personal own to grasp a great deal more related to this issue. I think there are some more pleasurable sessions ahead for many who view your site. It’s rare for me to find something on the net that’s as entertaining and fascinating as what you’ve got here. Your page is sweet, your graphics are outstanding, and what’s more, you use reference that are relevant to what you’re saying. You’re definitely one in a million, well done! I enjoy your writing style really loving this internet site. “Whatever you can do, or dream you can, begin it. Boldness has genius, power and magic in it.” by Johann Wolfgang von Goethe.